Website currently under construction–please return soon for improved content and functionality. The mission of the MCFSC is to inform, empower, and mobilize county residents to survive and thrive in a wildfire prone environment. Almost all vegetation will burn in severe conditions. But if you take wise actions about the plants around your home, you will greatly improve your property’s chances of surviving. Does this mean cutting down all the trees and bushes near your house? No. Wildfire safety does not require a moonscape or desert. It means carefully selecting and maintaining your vegetation to reduce the flames and heat that come near your buildings. Remember, everything that can burn is fuel for a fire. So the less flammable vegetation near your home, the better. But plants are also necessary to keep hillsides stable and prevent soil erosion. And, of course, they are beautiful and provide privacy! You can find a balance. Clearing this area will help prevent flames from touching your home. Remove EVERYTHING flammable: leaves, pine needles, weeds, and wood chips! Irrigated or native flowers, concrete pavers, bricks, decorative gravel, or rock mulch are good here — and can be very attractive. Firefighters call call this the “Lean, Clean, and Green” Zone. The better you maintain it, the better the chance your home will survive! Remove most flammable vegetation — make it Lean. Clear out dead vegetation and flammable debris — make it Clean. Irrigate the plants that are there — make it Green! This extended area, now required by state law, can provide a crucial buffer between you and a wildfire. Reduce the amount of flammable vegetation here by 30% or so. This will reduce the flames and heat coming near your home. 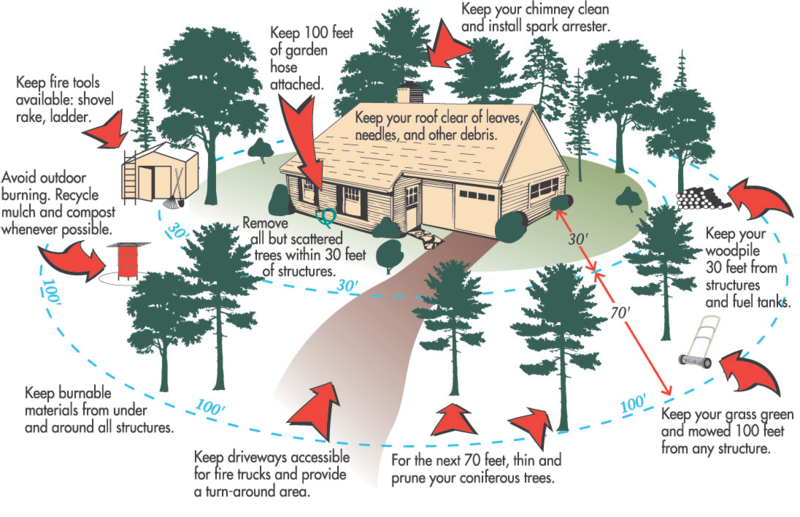 If you do your “homework” in this area, the flames of an oncoming fire will drop down from the trees to the ground and never reach your house. A key action to prevent spread of a fire is separating plants from each other. This will prevent a fire from jumping from grass to brush to trees, or from bush to bush or tree to tree. – Prune trees high enough that anything burning below them won’t catch the trees on fire. Firefighters request that mature trees’ branches be pruned up 10 feet from the ground, for the above reasons — and so they can work beneath them. Fires also spread sideways, of course. This can happen from direct flame contact or radiant heat. 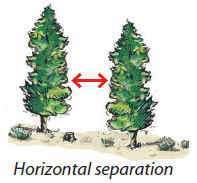 To prevent this, separate trees and bushes from each other horizontally. Rows of trees or bushes, just like wood fences, can carry fire a long distance very fast. Breaking up rows into sections will slow down a fire’s spread. It’s all about flames. Keeping your house and other buildings safe means keeping flames away from them. As we’ve seen before, those flames can either (1) rush to your house in a raging firefront, or (2) drop in from the sky as burning embers. It’s not just common sense . . . it’s the law! – Clear all flammable vegetation other than trees, ornamental shrubs, and green grass or ground cover out to 30 feet from your home, or to your property line, whichever is closer. Reduce the amount of native vegetation in the 30-100 foot zone. – Remove all dead branches from trees next to, or hanging over, any building. – Remove all tree branches within 10 feet of a chimney or stovepipe. – Keep all leaves, needles, and other dead vegetation off the roof and out of gutters. These requirements may seem harsh, but they exist for our sake. Fire engines and air tankers won’t always be nearby to help, so we must prepare to help ourselves. Around which buildings should we clear? All of those we want to save!